The next lecture in the University of New Brunswick’s Ideas that Matter Speaker Series will address the role of religious leaders and faith communities in helping abusive religious men become accountable for their actions. 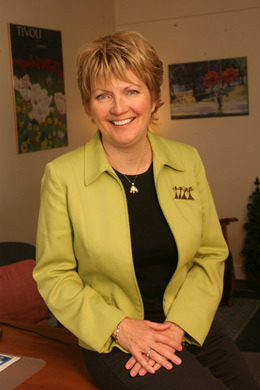 Nancy Nason-Clark, professor and chair of sociology at UNB Fredericton will present Holy Hush or Shattered Silence? Religion as Part of the Solution to Domestic Violence, Not Just Part of the Problem. The lecture will take place on Wednesday, May 1, at 7 p.m., at the Wilmot United Church, 473 King St., Fredericton. Admission is free and all are welcome. For more than 20 years, Dr. Nason-Clark has been researching and writing about the web of connections between religion and domestic violence. She has explored how religious faith impacts the journey towards healing and hope for victims and survivors, and the rhetoric - as well as the reality - facing religious leaders who are called upon to respond to families impacted by various forms of abuse. Following Dr. Nason-Clark’s talk, comments will be given by Terry Atkinson, senior pastor at Brunswick Street Baptist Church, and Lorraine Whalley, director of the Fredericton Sexual Assault Crisis Centre. Started in 2011 by UNB's faculty of arts, Ideas That Matter connects the community with high-profile research in a way that stimulates discussion. The series features leading scholars whose work in the social sciences and humanities helps shine light on issues and challenges that live at the heart of the province’s social values, cultural perceptions and political motivations. Ideas that Matter lectures are free and open to the public thanks to the support of New Brunswick businesses and the UNB Associated Alumni. The patrons for 2012-13 are: BioAtlantech, BMO Bank of Montreal, Bulletproof Solutions Inc., Goose Lane Editions, Innovatia Inc., King Construction Ltd., Knightsbridge Robertson Surrette, Mais Reynolds Financial Group, Remsoft, Stewart McKelvey, Sunny Corner Enterprises Inc., The Daily Gleaner, Valley Graphics Ltd.
Dr. Nason-Clark's interest in the coordinated community response has led her to study criminal justice, therapeutic and advocacy responses to the role of religious professionals as partners in ending domestic violence. Over the years, Dr. Nason-Clark and her students have conducted projects in Canada, the United States, Asia, the Caribbean, and eastern Europe. She returned to her native province of New Brunswick after completing her PhD at the London School of Economics and Political Science in England. She is the author or co-author of eight books, including No Place for Abuse: Biblical and Practical Resources to Counteract Domestic Violence and The BatteredWife: How Christians Confront Family Violence. Dr. Nason-Clark is the creator of the RAVE Project, a research initiative funded by the Lilly Endowment. She has served as president of the Association for the Sociology of Religion, president of the Religious Research Association, and as editor of Sociology of Religion: A Quarterly Review. A frequent speaker at both secular and religious conferences, her travels have taken her recently to Asia, New Zealand, and Turkey.